This is one of the FUNNEST loafs of breads you can make. 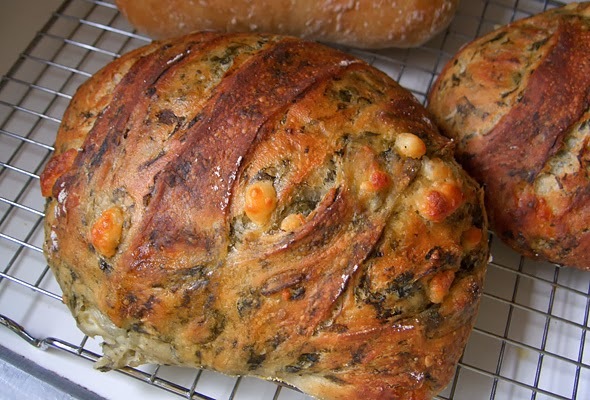 Basically, you just add spinach and feta cheese to either the basic boule or the olive oil loaf. 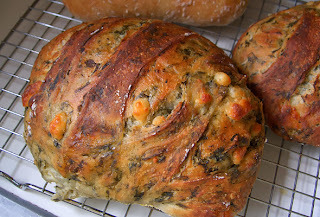 Last night, my wife and i baked some spinach and feta bread along with an olive bread. It turned out great. i followed the original recipe from artisan bread in 5 minutes a day exactly, using my KA flour and it turned out great. im thinking the elevation of 5300 feet(she lives higher than me) some how helped. For the spinch bread, mix the yeast, salt, spinach, cheese and water together in a 5 qrt bowl, then add the flour and mix. do not knead. just mix till the flour is all mixed in. dough will be sticky and wet. you can add extra flour to make it a we bit more dry. Rest 2 hours and then shape and bake. Goona coin that phrase now and sell my own bread packages. haha. I mixed the dough up with a bucket and a dang spoon. used my hands to get all the flour in the dough. let rise 2 hours and bada bing bada boom, nice dough. Shaped and cloaked(pulled dough edges toward bottom) TIGHTLY. i made sure that the dough wasnt sticky in my hands so i could pull and stretch. the bottom looked like a mess, but it cooked out. The skin ontop was smooth and tight. The loaves were AWESOME. the only one that overproofed was the baguette BUT i used two mini cupcake tins to hold the edges of the dough up on the stone so it wouldnt spread out. i let it proof like 90 minuets and it almost tripled in size. But the cupcake tins held it just fine. Served the bread with roasted tomato and red pepper soup! it was -9*F out side so we went to the lake and stood by the fire after dinner. And yes, the cats were watching the whole time. they seemed just as interested in bread baking as anyone else. Kinda funny.